Should I fix my old Casablanca fan, or buy new? If your Casablanca fan starts having issues, is it time to go fan shopping, or are you better off repairing it… and if you do fix it, how long will it last? These are the questions you’ll be asking if your Casablanca fan starts giving you problems. The good news is we have the solution! Fan Man Repair: The leader in fan repair & parts since 1983! Fan Man Lighting and Fan Man Repair have been the names you can trust for all your ceiling needs since the mid 1980’s. We have built our reputation on providing the best service possible, one customer at a time. When you sell quality products, it’s with the expectation that they will last a very long time. That’s why we have always serviced what we sell. It’s only normal that over time some parts may need repairing or replacing. The parts on your fan that are most susceptible to damage are the electronics. Storms, voltage spikes and other factors that take their toll on electronic components, may make it necessary to replace those parts at some point. Because of the quality of Casablanca fans, and especially the durability of their K55/XLP-2000 motor, replacing the electronics is your best option. No fan made today runs more quietly or efficiently than your K55/XLP-2000 Casablanca fan! 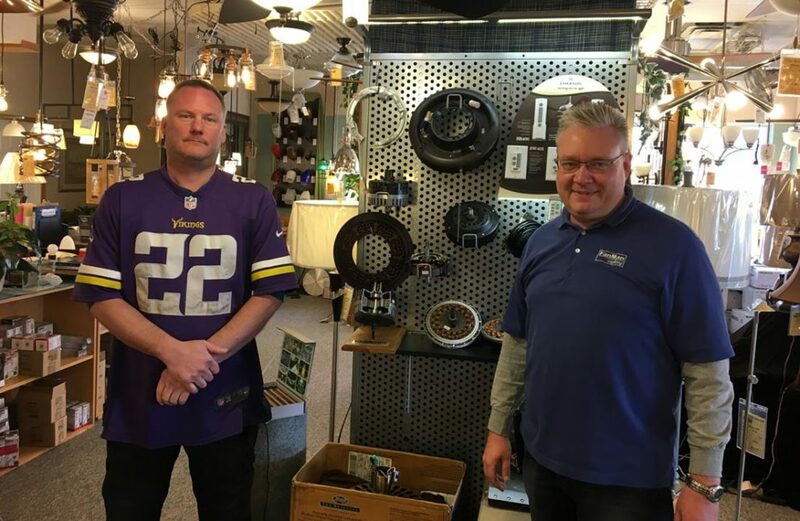 Service Manager Jack Metcalf, Jr. (left) and Fan Man Lighting Owner, Jason Stevens (right). Fan Man Repair has been a national sales leader of Casablanca replacement parts for decades, so when we learned that Casablanca (now owned by Hunter Fans) is discontinuing the Intellitouch family of fan controls (with millions currently in service), we knew we had to make some major moves. Due to the durability and strength of the K55/XLP-2000 motor, the electronic system typically fails long before the fan motor fails and because Casablanca K55/XLP-2000 fans run better than almost anything currently being made, we began Research & Development on a replacement system for the Touch family of fan controls. The result was Fan Man Repair’s complete line of Touch family replacement controls. 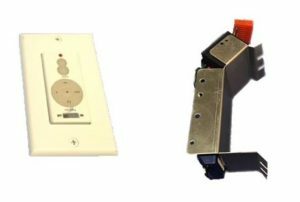 Our parts work perfectly with all Casablanca Intelli-Touch, Advan-Touch and Comfort-Touch ceiling fans. We’ve also added some great optional features that go well beyond what Casablanca offers, including Bluetooth control. Fan Man Repair has made it possible for you to optionally control your ceiling fan from your smart device, via bluetooth! Even better, you can control a single fan from your smart device, a wall switch and a hand held remote, all at the same time! What could be more convenient? So before you decide to replace your non-working Casablanca ceiling fan, think about the advantages of fixing it! Give us a call and we can help you diagnose your problem and provide you with a solution that will keep your fan running for many years to come. We have do-it-yourself instructional videos for those who wish to repair their fan themselves and we have a list of “Preferred Technicians” who are familiar with our products and experienced in replacing the components in your Casablanca fan.